Spc. Fernando Daniel Robinson of Hawthorne told his friends and family he was proud to be a soldier, despite the loneliness, terror and fear. 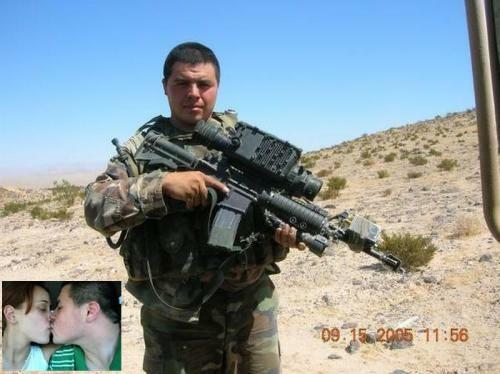 The 21-year-old soldier died October 2, 2006 in Korengal, Afghanistan after enemy forces attacked his patrol using small arms fire and rocket-propelled grenades, according to the Department of Defense. 'I have lived times others would say were best forgotten, at least someday I will be able to say that I am proud of what I was, a soldier,' he wrote recently on MySpace, the popular online networking site. Stationed in Fort Drum, N.Y., Robinson graduated from Lawndale's Leuzinger High School in 2003. On his Web page, he described himself as married. Fernando Robinson didn't have a ring, but he got down on one knee anyway and asked the question he had been waiting to ask since high school: Maria, do you want to be my wife? She said yes, of course, but the couple never had the chance to buy an engagement ring. Fernando, a young soldier whose childhood nickname was Commando, was leaving for the rocky front lines of the war in Afghanistan. He was killed earlier this month during a firefight in eastern Afghanistan, days after he proposed to his high school sweetheart. He was 21 years old. Fernando grew up in Hawthorne, a daredevil of a kid who always impressed his friends with his expert aim with a slingshot. He once chipped one of his front teeth by crashing his bike off a jump; years later, his friends in the Army would call him Chomper. But his friends in the neighborhood knew him as Commando Fernando because he always wore fatigues and watched war movies. He knew he wanted to join the Army before he even got to Leuzinger High School; once there, he signed up for Junior ROTC and never missed a chance to talk to visiting recruiters. He met Maria there, too, and soon they were going everywhere hand in hand. Just before he enlisted, he borrowed the wedding band his mother had stored in a bedroom drawer, slipped it on Maria's finger and asked if she'd marry him. Someday. He left in 2004 and trained as a specialist with a light infantry combat team based in Fort Drum, N.Y.; he shipped out for Afghanistan this past spring. He told his friends and family that he always had to be alert for ambushes because enemy fighters could hide among civilians. He came back to Hawthorne last month for a two-week visit. His brother took a picture of him at the airport, with the afternoon sun glowing behind him. He was smiling so big that, even in the picture, you can see that chipped tooth. Fernando hung out with friends and played video games with his brother, but mostly he spent time with Maria. They had been apart for so long that they took comfort in little, everyday moments: making dinner for each other, doing laundry, watching television. He proposed on the front porch of her family's home -- this time for real -- just before he returned to Afghanistan. His brother, Francisco, took him to the airport, gave him a quick hug and drove off with the words: 'All right, man, see you later.' But on the way home, Francisco broke down in tears and dialed Fernando's number on his cell phone. It was the last time Francisco talked to his brother. Fernando was killed Oct. 2. The Department of Defense announced his death with a brief statement that said his patrol was attacked by enemy fighters armed with guns and rocket-propelled grenades. His mother said he was shot twice -- once in the chest and once in the side -- as he entered a village. A medic tried to keep him alive with CPR, but he was pronounced dead about 20 minutes later. Fernando is survived by his father, Ricardo Acosta; a sister, Kristina Acosta; and a brother, Jonathan Acosta, in addition to his brother, Francisco Robinson, his mother and his fiancee. The family is still making funeral arrangements. Maria could not be reached for comment, but related details of her engagement to Fernando to his mother. Fernando had planned to send money to Maria so she could buy her engagement ring. Instead, his mother is having a white-gold band with four small diamonds sized for Maria's finger -- the same ring her son once borrowed from her bedroom drawer.